Pigeons are incredibly destructive to buildings, bridges and vehicles which is mainly due to the corrosive acids in their droppings. In fact, pigeon droppings can strip the paint and sealant off of a bridge in a matter of years. With budget cuts becoming more prevalent, this is becoming an increasingly dangerous problem. Pigeons also create the potential for contaminated food when they are living in food packaging plants as their droppings often get into the food supply. If you are having issues with pigeons destroying your property, here are some do-it-yourself tips to get rid of them for good. There are many pigeon prevention products available. The worst are gimmicks like fake plastic owls, sound machines, sparkly shiny things, etc. 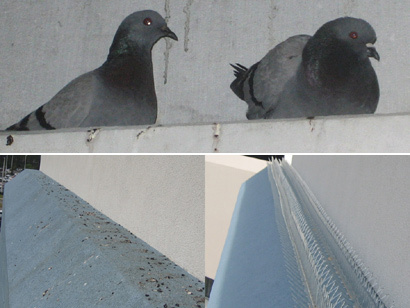 The best are products that prevent pigeons from landing and roosing on any particular area. These include spikes, needle strips, shock tracks, wires, sticky tracks, and exclusion netting. The cheapest, and perhaps easiest, way to deter pigeons from stooping and building their nests on your property is to coat the ledges with spices. Pigeons don’t seem to like strong scented spices such as onion, cumin, pepper, garlic, chili, Tabasco and cinnamon. However, repellents like this are not guaranteed to keep the pigeons at bay and the spices will have to be put back down every time is rains or when there are high winds. A great alternative to using spices is to use a motion detected sprinkler system deterrent. You can pick these up online or in some garden or hardware stores. These sprinkler systems can be set up to aim at the places that the pigeons are stooping on and will activate when a pigeon ventures into its trigger zone. If you use this system all the time, the pigeons will learn where they go and where they cannot go. What is really great about using a system like this is that it is 100% safe and non-toxic to the bird. Pigeons need a flat and stable surface to land on and stoop comfortably. If you make the surface of your ledges unstable, the Pigeons will not land on them. There are spiked and knobby landing strips that you can buy from any hardware or garden store that will do the trick. They are usually inexpensive and have a peel-off back adhesive that makes applying the strip really easy. This method is also 100% safe for you and the bird. Another method that you can use is an anti-trapping method called exclusion. Your goal is to exclude the pigeons from your space, making it impossible (or very difficult) to stoop. You would be surprised how far just doing something as simple as patching old holes with wire mesh or hanging netting up in the rafters of your building that cut off their access to those ledges. Again, you can pick these up in most garden or hardware stores. There are chemical sprays that you can put down on the ledges that pigeons like to stoop on, but you should reserve this option as your last resort. These chemical sprays make the ledges sticky and really uncomfortable for the pigeons to land on. While these chemical sprays are designed to be non-toxic, you never want to use chemicals on animals without trying other options. You also run the risk of trapping the bird in the sticky tack and will then have to do a dangerous climb to remove the bodies. Go back to the main Pigeon and Bird Removal page for more information about bird prevention, and more information about how to keep birds away. There is no doubt that pigeons are nuisances. They are one of the most prevalent birds in the world, living on every major continent with the exception of Antarctica. When one thinks of pigeons, they usually think of the gray and white birds that are all over city parks and bridges, but these feathered creatures come in a vast array of colors and sizes. Pigeons are incredibly smart, even though they act dumb and they make a loud cooing sound. Pigeons have no boundaries and will build their nests anywhere that is near a food source.